These are the posts I made about the race on Sailing Anarchy. I am sitting in the warm and dry at home after retiring on Yeoman XXXII. Last night was hard work for sure. Sea conditions were unpleasent and wind was in the high 30’s. 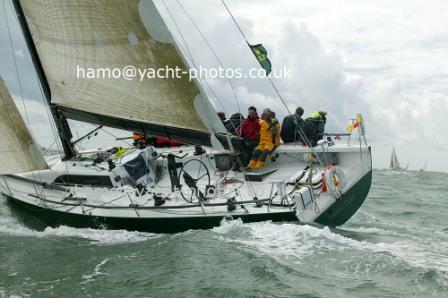 We were alongside Snow Lion having caught up with them in the Solent when we retired. We changed from the number 4 jib to the storm job and had 2 reefs in the main. The change from 4 to storm jib was unpleasant on the bow, I was happy I was wearing my drysuit. I was being fully thrown in the air on the foredeck while trying to do an inline peel the storm jib went up and then stripped out of the tuff luff. So dropped both jibs in the process of dropping the number four I was lifted off the deck over the lifelines and into the water. The jib was in the water as well so I fell in the belly of it and then got tossed back onboard by the next wave. A little bit of night time excitement. Tying the storm jib to the tuff luff was a large effort as the pulpit is so narrow you have to wedge yourself in place to get far enough foward to tie the reef knots creating a feeling of being captured – not nice. A 1/2 hour after hoisting the storm jib we decided to go for the trysail so called all hands for the manuouver. We dropped the sail to deck and used a line to lash the boom in between the two wheels while we got the main under control a large effort seeing as the main has a luff rope we got the main to weather and everyone sat on it and then rolled it towards the boom. We took a mooring line and used it to tightly tie the main to the boom. We took the main halyard off the head of the main and I held it there was so much windage that it was being pulled out of my hands. We got that onto the rig and attached the clew to the outhaul on the boom as we wanted the boom in the air rather than lashing it to the deck as I feel this is dangerous if it breaks free in a large seaway. we retired after hearing splittering carbon as the trysail pulled out of the track on the back of the rig. Have to go to sleep now very sore. The mainsail had pulled out of the bottom of the track about a foot when we went to change to the trysail. I believe this was due to the strop holding the tack forward not being tight enough altering the tack set back. Remember this is only the second offshore race this boat has done. The last was the race to key west where we saw wind in the mid 30’s but we were going downwind. The luff tape on the trysail was very slightly larger (maybe less than a mm) and I believe that might have put pressure on the track. Also our track is only reinforced where the head of the sail sits in the track when we are reefed or when the trysail is up. We put the trysail in the track two days before the start and we didn’t think to wonder whether the area where the tack fitted needed to be reinforced as well. There is a strop on the tack which lifts it above the main as it would be near impossible to get the tack attached at the actual fitting with the main on the boom. This meant the tack was bearing in a non reinforced area of the track. I used the trysail twice this year on delivery but it was only 25 knots of wind at the most and it had worked fine so I believe it was a mixture of a lot of factors which caused the failure. The wind was in the mid 30’s gusting to the high 30’s when we went for the change. One of the crew mentioned that hoisting the trysail wooled would mean you could get luff tension before putting any pulling force on the track. We might alter our trysail with some cringles to allow the sail to be wooled. This would mean using the reef line as a sheet on the end of the boom to ‘launch’ the sail. The next morning we found that our number 2 reef line was about to explode due to chafing on the sheave a tie down might have given us some more time to deal with this if that had occured but the conditions were such that it was a little dangerous to go hanging on the end of the boom tying the clew down. Also we were not tying the belly of the sail up for the same reasons. If we had tied the belly up we would have gone through the cringles and around the sail not the boom so that in the case of the clew failing we would have not been in danger of ripping the sail as the load would have transferred to the cringles. I much prefer a system of tie downs that has a sacraficial patch on the sail with webbing loops so that pulls off the sail instead of cringles which rip the sail. We will be sending the main back to make these adjustments. This would have been my fifthÂ FastnetÂ and 6th time around the rock I am looking at the tracking information thinking about how fun the ride would have been on Yeoman coming home. We would have been roaring home atÂ a high rate of speed. Oh well. I guess we weren’t the only ones!! I was being fully thrown in the air on the foredeck while trying to do an inline peel the storm jib went up and then stripped out of the tuff luff. So dropped both jibs in the process of dropping the number four I was lifted off the deck over the lifelines and into the water. There are times you know that you can do embarrassing things like a bare headed change. The boats that werenâ€™t to proud to drop the headsail, get It below, and then get the storm sails out will be rounding the rock about now. It was really great fun mate even got fresh calamari in the mouth!!! You should have seen the jibs below horrible mess no bags on etc… just get the jibs below at that point. The inline was working fine as we had a jib cunningham on and the bottom part of the 4 was unhooked. Should be fine doing an inline in the low 30’s if you don’t have a sail that strips out of the tuff luff but obviously when the helmsman had the head of the storm jib flapping around his ears it was time to drop both and start again!!! I am not to proud to do a bare headed when conditions warrant but it wasn’t really necessary at that point as we were changing early down to the storm sail. We weren’t putting the storm sails up for survival conditions we were putting them up for speed and angle of boat issues. Also leaving a sail up give you the benefit of keeping crew members aboard when the waves are washing them down the deck.